Hopefully this won't offend too many golfers out there, but when I first saw this saying on a t-shirt a few years back, I thought whoever came up with it really understood the addiction of riding dirt bikes, and maybe somehow even my personal dislike of the sport of golf. I think this extends beyond dirt bikes and into all types of off-roading as well, but those who ride will really know where I'm coming from when I say that wherever I go, often all I see are the possibilities of a perfect lip, or a nice gap to jump, or a killer climb. Until recently I thought that I was a little more over the edge than most, but I really think that if you love riding dirt bikes it gets into you in a way that's hard to describe. My son and I were recently looking at a painting on tv and he surprised me when he said, "dad, I like that painting". It wasn't anything great, it had a dead tree in the foreground and that was about all I saw, then he said "yea, look at all those hills(in the background) I could ride my dirt bike on!". It was a proud moment for a father, and a realization that maybe I'm not so crazy after all! You would think that with this type of addiction I would be able to understand people's addiction to golf. I can't tell you how many times they show golf on tv instead of a supercross or motocross event, so I know there must be something to it for a lot of people, but this is an off-road site, not golf digest, so you're going to get my biased opinion. There are plenty of events that could and should take a front seat to all these golf games shown in luscious HD on Sunday! I get a little upset when I set my dvr to record the X-Fighters Moto-x freestlye competition while we are out riding only to come home and find that it has recorded golf instead! The channel that use to have this type of format was removed from my choices "for my convenience" so they could add even more useless HD programing. I have to laugh a little when some of my younger friends say they just had a killer game of golf..really? Come on man. The only thing killer about a game of golf is walking from hole to hole when there are no carts available. When they decide to get really crazy, they walk even when there are carts available! Honestly though, I suppose I should be glad that what we do is not so main stream. That's really part of what makes it so glorious. 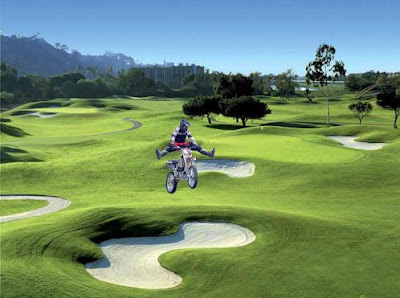 Even if golf courses were motocross tracks, they couldn't hold a candle to natural terrain and the feeling of freedom that comes from being overwhelmed by the landscape and the ability to at least partially conquer it, but at least now you have a little bit of an idea why I believe that golf courses should indeed be motocross tracks!! Love it! 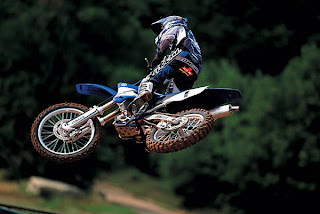 Although I am not quite as big of nut when it comes to motorcycles as you I still think a motocross track is a better use of land then a golf course. You better be careful because some political leader can see this and then close down Caineville and turn it into a golf course or at least a national forest. Most political leaders are golfers. Like Obama, he's a big time golfer. lol! I dare you to go ahead and ride on the golf course in Logan. I can come and support you! Wayne would be proud too! I don't know about dad though. I don't think he cares but it would be a lifetime opportunity. I am not going to bail you out of jail though. If they can catch you! lol!